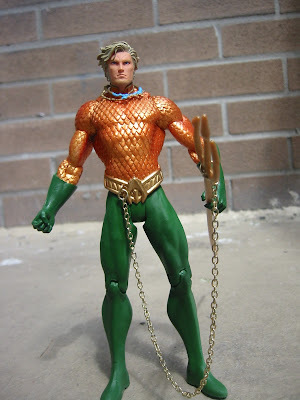 Fruitless Pursuits: New 52 Justice League Aquaman - The Action Figure! New 52 Justice League Aquaman - The Action Figure! Ok, I didn't forget! I'm just slow! Presenting the next release in the New 52 Justice League series of action figures from DC Comics - AQUAMAN! The good old grumpy King of Atlantis and friend to Sea Creatures everywhere finally gets to take his place next to the other heroes on my shelf in plastic form! Check out some pics and thoughts After the JUMP!! Tuna is Murder! Recycle your plastics! Which way to the Ocean?? This representation of Arthur "Aquaman" Curry is once again very faithful to the Jim Lee design from the Justice League comic. He reflects the grittier New 52 design, with his younger, wilder looking features and wind tossed, grunge-inspired hair and scruffy beard. Despite being dressed in green and orange, he manages to look imposing! The sculpt on this figure is great! I'm super impressed by the detail in the scale armour...each tiny scale is sharp and well defined and makes a great contrast the the green, hide-like supple smooth pants and gloves (I imagine they're made from sharkskin or something). Every detail is nicely done and I can't think of a single thing to complain about! Seriously, why am I in this city environment? Isn't there an Ocean around here somewhere? Paint on the figure is quite nice too. I love the orange of his scale mail...not only does it have a nice metallic sheen, it's not all one single colour! The orange is subtly gradated and shaded to highlight some of the details and just give it a more weathered, armoured look...suitable for an ancient Atlantean scale mail suit. His hair, face and eyes are also well done and sharp..the eyes in particular are great, even down to the sparkle in his iris! If I have any complaints, it's that the blue gem/decorations on his necklace are a little blobby looking. Of course, the whole necklace is more or less an in-joke from the first issue of Justice League. Green Lantern makes fun of Aquaman, telling him to "lose the necklace". He actually does, in future issues, too! Batman and his 3 bright, colourful decoys..er..um..I mean TEAMMATES! Welcome to TEAM ORANGE!! Our mission: Find the $*(%& OCEAN!!! Ahh, the eternal struggle. Cat versus Fish. So yeah, overall I'm really happy with this figure, even though, you know, he's AQUAMAN. I never thought I'd own a plastic representation of the King of Atlantis, but if it had to happen, I'm glad it's THIS figure. Actually, I make fun of Aquaman, but the New 52 version written by Geoff Johns is actually a pretty cool hero. Give the poor guy a chance, it's not his fault he has to dress like a fishing lure! You know he can lift a car, right? Ahh, I found the Ocean AT LAST! Sigh...Home Sweet Home! That's it for Aquaman! Next figures released in this line are The Flash and (the first) villain, the Parademon, a henchman of Darkseid! See you soon!